What started many years ago with a vision is beginning to take shape. 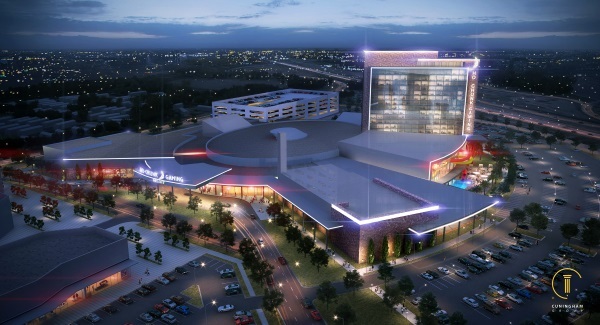 Plans for the Ho-Chunk Nation to construct and operate a casino in Beloit are beginning to move forward and City of Beloit officials are eager to get the construction underway. The Bureau of Indian Affairs (BIA) has recently published a Notice of Availability of a Draft Environmental Impact Statement for the Ho-Chunk Nation Fee-to-Trust and Casino Project. The next step is to hold a public hearing on the environmental impact study. “We are certainly eager for the public hearing on the Environmental Impact Statement at 5 p.m. Tuesday, Dec. 11, at Aldridge Middle School in Beloit. This is an important next step for the ultimate approval from the Bureau of Indian Affairs,” said Beloit City Manager Lori Curtis Luther. Public comment on the draft environmental impact statement can be submitted up to Dec. 24, according to an announcement by the BIA. Legally, the Ho-Chunk Nation is allowed to build the casino based on an agreement with the state many years ago. Prior to opening its casinos, the Ho-Chunk Nation negotiated a gaming compact with the state of Wisconsin in 1992. With a few amendments over the years, the gaming compact included the language of a future fourth casino location, as well as ancillary sites. Ho-Chunk Gaming locations in Wisconsin Dells, Black River Falls, and Nekoosa operate as three of the Nation’s casinos, while Madison, Tomah, and Wittenberg are ancillary sites. Beloit officials believe the hearing on Dec. 11 will not reveal any opposition. “This is part of the process that is required by the Bureau of Indian Affairs,” Curtis Luther said. “But, technically, the input should be on any potential environmental impact of the proposal and we don’t believe there is any negative environmental impact. So, it’s less about individual promotion or concerns about the development in general and I think it is supposed to be more specific about environmental impacts. “Because we don’t believe there are any, I would anticipate this going smoothly and hopefully moving us on quickly to the next step,” she said. She said they believe that the Bureau of Indian Affairs would be moving forward with their approval of the application and, once the Bureau of Indian Affairs has signed off, Governor-elect Evers will sign the approval of the casino. “Evers has stated his support, so we believe he will approve the application and the review. We’re certainly grateful for his support,” Curtis Luther said. According to the 2010 Census, Beloit, with a population of 36,966, and has an unemployment rate of 6.3 percent. The median income is listed as $36,384 and the average home price is $90,900. The median age in the city is 33.1 years, with 27.1 percent of residents were under the age of 18; 12.1 percent between the ages of 18 and 24; 25.7 percent from 25 to 44; 23.1 percent from 45 to 64; and 12 percent 65 years of age or older. The gender makeup of the city was 47.9 percent male and 52.1 percent female. “This would definitely be the top employer in the city and this is going to do wonders for the city,” said City Council President Kevin Leavy. According to Sarah Millard, Beloit’s director of strategic communications, the proposed project will be the city’s largest employer. It is expected to employ approximately 1,500 people. “Over the years, our unemployment rate has been going down but this is definitely going to help us as we talk about bringing the number of jobs to the city,” Leavy said. “These are jobs for our residents to apply for and these are going to be livable wage jobs. So these are not just going to be any jobs, they’re going to be livable wage jobs and that’s going to meet the needs of our community that people have been asking us for. When we look at new businesses we bring to the city, we have to make sure the wages are livable so people can make a living,” Leavy said. The proposed $405 million casino-resort project includes a casino, a 300-room hotel, an indoor waterpark, a conference center, an entertainment venue, and an adjacent retail development. It is uncertain at this point what additional businesses will be situated within the area. City officials said that the recent release of the environmental impact study by the BIA is the most progress they’ve seen on this project since it was initiated. It is possible for a late 2019 or early 2020 construction start. “The city views this as a unique opportunity to benefit both the Ho-Chunk Nation and the City of Beloit with jobs and revenue to support both communities as a whole. We’re really proud of that effort,” Curtis Luther said. “Really, we can’t say enough about the positive partnership that the city of Beloit has had with the Ho-Chunk Nation,” she said.